Linmoore Fencing offers a variety of commercial security fence designs to ensure the safety and protection of your business location. Commercial security fences generally focus more on function than aesthetic beauty, and most of the fences we have done in the past reflect that: customers want plain, simple lines that convey serious power rather than artistic inspiration. However, keep in mind that we can do custom designs and make your commercial security fence look any way you want. One popular element in commercial security fence designs is the top portion of the fence that bends outwards. This discourages people who might try to break in by climbing the fence, as it makes it very difficult if not impossible to climb up that portion of the fence. In addition, we can add other climbing discouragement devices to the top of your commercial security fence so that you can be certain no one will break in to your business after hours by jumping over your Linmoore iron fence. Another popular element is the wall underneath the fence. Some people want a fence that goes all the way down to the ground, but others prefer to have a wall on the bottom portion of the fence, blocking the business inside from view, and a commercial fence above that to prevent anyone from climbing the wall and dropping inside. If you have a specific commercial fence design that you need, do not hesitate to talk to us at Linmoore Fencing! Our skilled experts can make sure you have exactly the commercial fence you need, and that it is up to all your specifications. We can also do your commercial gate, whether you want a basic motion detector opening mechanism, a remote opening gate, or a keypad entry system. We also offer a wide variety of security system options so that you can know who is around and entering your gate or fence at any time, and so that you can discourage intruders. Wrought iron fences are an important part of many Sacramento, CA homes, and there are many designs to choose from. 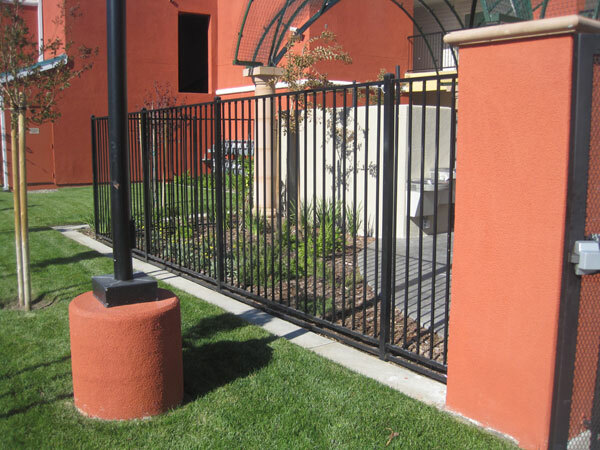 At Linmoore Fencing, we pride ourselves in providing Sacramento residents with the most beautiful wrought iron fence designs available, and you can look at our photo gallery for evidence of the talents of our design team. Whether you are looking for a simple, elegant look for your wrought iron fence, or whether you prefer an intricate and ornate design; whether you like the look of European old-world charm, or whether you like a sleek and modern look, we have a wrought iron fence design that will fit your artistic taste and look amazing with your home and landscaping. Or if you have a particular design that you have been working out in your mind and want a completely custom job, we are happy and eager to turn your dreams into reality. Give us a call today for a free estimate, and see how beautiful a custom wrought iron fence from Linmoore Fencing can make your property!